After walking her down the aisle, the father of the bride has one more shining moment of the night – the Father Daughter Dance! First dances are always a difficult decision seeing as the majority of brides/grooms aren’t professional dancers, nor have they choreographed something worthy of “So You Think You Can Dance”. Not to worry though, if you’re not a dancer (or your father isn’t), you’ve just joined a group of almost every other bride out there. But what will make your dance different from every other bride out there? Well, can the father/daughter have fun? John Mayer or Ray Charles? George Strait or Mumford and Sons? It’s hard to pick the right tune, but when in doubt, I usually recommend to have fun! Swaying back and forth to a slow song can be meaningful and touching, and for some people that is the priority. But for those of you who would rather avoid ruining makeup with tears, why not pick something up beat? Keep in mind, your Dad likely has years of dancing under his belt (for better or worse), and though he might not be ballroom ready, he might be able to lead you better than you expect. 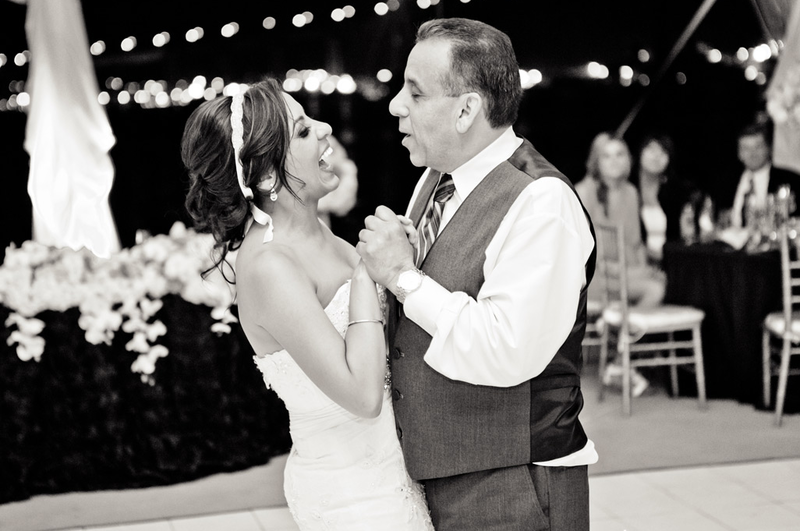 Often times brides/grooms request to skip the father/daughter and mother/son dances all together. Though there is nothing wrong with this, make sure you run it by your respective parents first. This might be the moment your Father has dreamed of for years, so even though another featured dance could give you the heebie jeebies, it might mean the world to pops! And maybe he has some great insight about a song written during your birth year, or a song that always reminds him of you. Though the day is about you and your marriage, these 2 minutes are all about your Dad – so ask him! 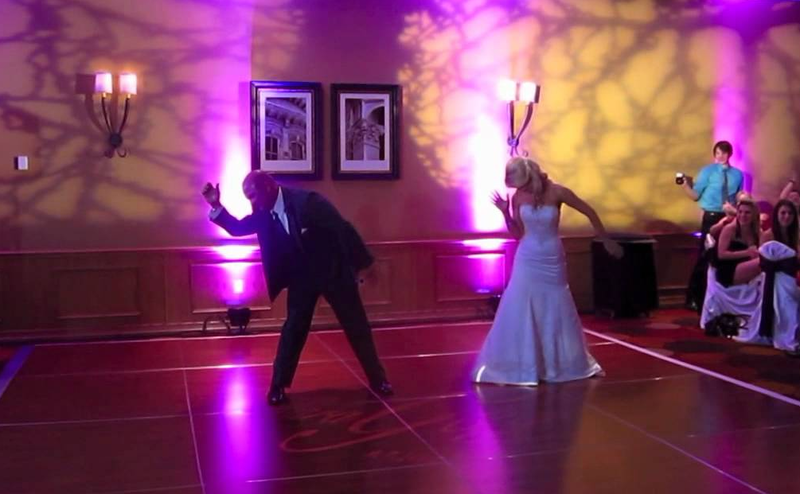 There’s very little that can go wrong with a first dance, but my main recommendation is to keep the tune short. It’s alright to pick a 5 minute tune, but allow the DJ or band (or dueling pianos!) to fade out after about 2-3 minutes. This is Dad’s moment, but remember that your husband’s mom is up next (and you don’t want your dance to signal guests to hit the bar or restroom). Short and sweet is a great way to give Dad his due respect without losing focus of the main reason people are there – to celebrate! Otherwise, just relax and go with it! In all the weddings I’ve seen, there isn’t a single Father Daughter Dance that sticks out in my mind as going terribly wrong. This isn’t meant to be a high pressure situation, so don’t over think it! Even if you trip and fall, who better to pick you up than Dad! Still stuck on the first dance? Below are a list of some potential tunes to get you moving in the right direction. Keep in mind that these are only ideas and are by no means a comprehensive list. There are no bad choices when it comes to picking your Father Daughter dance music, and most times, the first tune you agree on is the best! Have fun with it and don’t be afraid to have a sense of humor here – Dad wants to show off his little girl! And don’t forget that we have an entire blog series dedicated to selecting the right music! Click here for our Wedding Music Blog Series, or if you have any questions about picking music or booking our show, try our contact us page. Good Luck with your Father Daughter Dance!